This wonderful fairy stamp is part of a collection of stamps created by Elizabeth O. Dulemba for Justrite Stampers. I was lucky enough to win this set not too long ago and I've been staring at it ever since. I wanted to be sure that when I pulled her out to stamp and color her, she would be perfect. 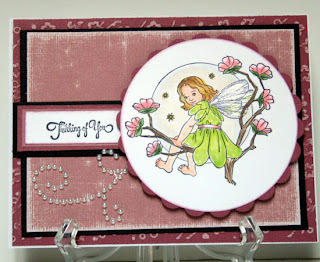 Since ICOPIC is having a DT call, I took the plunge and created this card in shades of pink. I had just so much fun coloring her with my Copics. Check out the sparkle on her wings from a fabulous clear Spica pen. I wanted to sit her on an embossed background, but I inadvertently embossed the bottom layer of cardstock! Oh dear. Not having any more of this color, I decided to change my thoughts and use the embossed piece as the bottom layer. I took a smaller piece and matted in with black cardstock then lightly sanded the top layer for a soft whimsical look. Love Core'dinations cardstock for this ability!!!! Just a bit of bling added to the sparkle on my card. Now off to keep my fingers crossed! Oh, this is adorable! Love that cute stamp! !